The Holy Island of Lindisfarne acts as a spiritual magnet for hundreds of thousands seeking refreshment and renewal, drawn to the ancient Christian site by the sense of God's presence. Prayer, meditation and worship are at the centre of the island community's life. Keith Duke, encouraged by David Adam, the priest-poet of Lindisfarne whose words he sets, together with those of Ray Simpson and others, has developed a musical language that has its roots in Celtic music, yet speaks too in the twenty-first century. Sacred Weave contains fourteen beautiful pieces sung by the group 'Celtic Voices' with instrumental accompaniment including flutes, whistles, guitar, harp and keyboard. 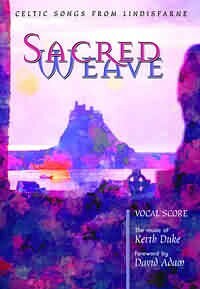 Sacred Weave Vocal Score by Keith Duke is published by Kevin Mayhew and is our 28324th best seller. The ISBN for Sacred Weave Vocal Score is 9781844170517. Beautiful holy music enjoyed by everyone in our music group at church. Highly recommended. Got a question? No problem! Just click here to ask us about Sacred Weave Vocal Score.